Beaches Backpackers Airlie Beach is located in the heart of Airlie Beach, just across from the waterfront and Airlie Beachs Lagoon swimming pool. Beaches unique central position and popular Bar & Restaurant provides nightly entertainment and offers the best of Airlie Beachs famous nightlife. As we are a licensed bar you must be over the age of 18 to stay with us. The friendly team at Beaches Backpackers are trained to give genuine advice and offer great deals on a range of sailing, scuba diving, snorkelling adventures & day tour options to help you make the most of your stay in the Whitsundays, ensuring that you experience the best that this area of the Great Barrier Reef Marine Park has to offer! The hostel is well established and provides loads of the comforts you crave from a Backpackers. The hostel has a range of dorms, twins and doubles, with rooms featuring an ensuite bathroom, air conditioning and private balcony. Our rooms are cleaned daily by our sensational housekeeping team. And, you havent experienced Airlie Beach if you havent ventured into the famous Beaches Bar & Bistro! Relaxing with a cold beer at the Beaches Bar and soaking up the atmosphere in the most popular beer garden in Airlie Beach is a must on any trip to the Whitsundays! Visit the Whitsundays and stay at Beaches Backpackers for an experience to remember! 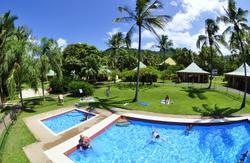 We are 500 metres from the Bus Station, just across the street from the Airlie Beach Lagoon. If arriving by bus, look out for the Purple beaches bus for your free ride back to the hostel!